Last year, the Foundation raised just shy of its fundraising goal of $1.25M with a total gross revenue of $1.214M. 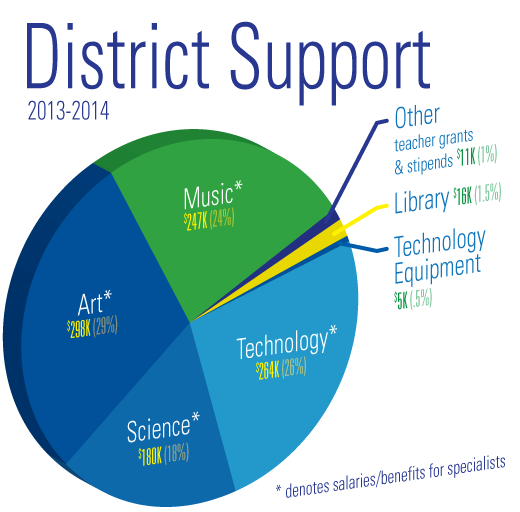 Our commitment to the District was $1M. Due to the generosity of our families, Biz partners, and other community members, we were able to meet our commitment and have a surplus of $23K that has been rolled over into the 2014-15 spend plan. SPARK’s largest source of revenue was generated from the Annual Giving Campaign, which made up 75% ($886K) and marked the 5th straight year in a row of hitting a new fundraising record for the Foundation. Thanks to generous local and family business supporters, SPARK Biz maintained its 6% share ($69K) of gross revenue from the previous fiscal year. In 2013-2014, SPARK’s three fundraising events — Golf Tournament 5% ($55K); Spring Spotlight (formerly known as the Fashion Show) 4% ($49K); and Online Auction 8% ($100K) — combined raised 17% ($204K) of the gross revenue. eScrip contributions contributed 2% ($28K), which is down from 2012-2013. 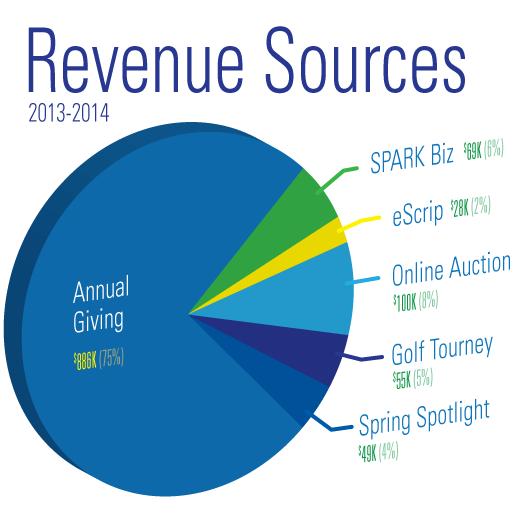 Revenues for Golf, Annual Giving, and Spring Spotlight experienced an increase from 2012-2013. The Foundation did not hold an auction event this year and, instead, launched an Online Auction. Note: For the purposes of this outline, numbers were rounded to the nearest thousand and percentage. SPARK also funded materials and supplies that included: digital art equipment at Hall, science materials at Hall and Neil Cummins, technology equipment District-wide, Library books at The Cove, and 5th-grade Outdoor Science Program at Hall. In addition, some funds were granted to each school site to support teacher stipends for MAST-related, after-school programs and new-teacher mini-grants to help them set up their classrooms. The breakdown for MAST was: $247K for Music; $298K for Art; $180K for Science (including $30K for Outdoor Education); $264K for Technology (which includes equipment for the District); $11K for Stipends; $5K for Library; and $16K for the library set up at the Cove School. As a non-profit foundation, SPARK strives to keep its SG&A and fundraising costs to a minimum. Overhead expenses totaled $78K, which include bank charges, postage, office supplies, database software, and 2 part-time staff (an Operations Director and Bookkeeper). This accounts for 6% of gross revenues. Fundraising expenses totaled $93K, which included all costs associated with event production (catering, venue rental, decor as well as directory printing, and marketing assets). This is a decrease of nearly $70K from the previous year because there was no auction event. This accounts for 8% of gross revenues. Of the $1,214,000 raised in 2013-2014, just over $1,000,000 went directly to the District to pay for programs, teacher salaries, and materials at the three schools. For financial information on previous year 2012-2013, click here.